STRESS SUPPORT; want premium, effective relief from tension, stress and anxiety? Our Stress Support is a natural, premium supplement formulated to promote a healthy, relaxed mood with improved sleep, together with a range of health supportive vitamins and minerals! PREMIUM HERBAL BLEND; includes gentle, natural herbal extracts with Valerian Root, Chamomile Flower and Inositol to gently relax and ease tension without unnatural synthetics or ingredients! HEALTHY FORMULA; also includes minerals and B vitamins to promote and support optimal health and energy during stress for robust health in a premium GMO free formula! LONG LASTING SUPPLY; long lasting, great value 90 tablet supply in every bottle, making constant reordering and running short a thing of the past! MANUFACTURED IN THE USA; manufactured in the USA in a GMP certified facility for unsurpassed purity and quality in every bottle, and backed by our 100% lifetime quality guarantee, click the Orange Button to order now! STRESS SUPPORT: GENTLE ANXIETY RELIEF WITH A POTENT HERBAL FORMULA! Do you lead a super active lifestyle, and at the end of the day would like an effective, gentle formula to promote relaxation and a stress free mood? Rather than artificial ingredients, would you like a gentle, natural herbal formula? 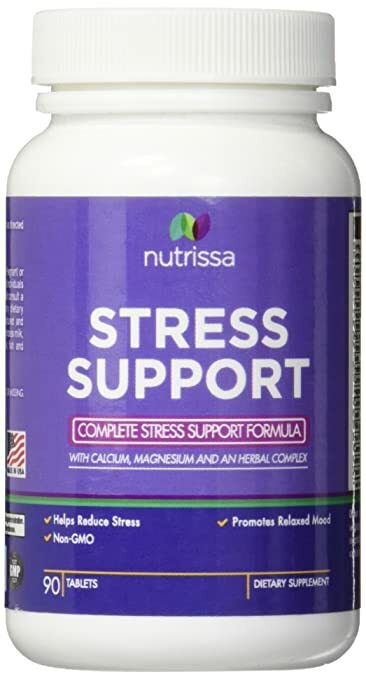 If so, Nutrissa’s Stress Support is the perfect stress support formula for you! Formulated with a premium, proprietary blend of vitamins, minerals and mood supportive herbs, our Stress Support works to naturally ease tension, anxiety and stress with proven herbal extracts including Valerian Root, Chamomile Flower and Inositol, for improved sleep and natural stress relief! Ideal for supporting general health and a busy lifestyle, our Stress Support is formulated with a wide spectrum of added B vitamins and minerals, with calcium and magnesium. Each bottle of our Stress Support is completely free from GMO ingredients, and provided in easily absorbed, non irritating capsules for fast acting stress relief! Proprietary blend helps reduce stress and anxiety for a relaxed mood and improved sleep. Includes B vitamins, calcium and magnesium for optimum health and energy. Formulated with natural extracts of Valerian Root, Chamomile Flower and Inositol. Gentle, easily absorbed 90 tablet supply. Manufactured in the USA in a GMP certified facility. Lifetime satisfaction guarantee. If you’re experiencing stress and anxiety and would like a gentle, natural supplement to ease tension and promote a relaxed mood for improved sleep, with proven, natural herbal extracts and vitamins and minerals for optimal health, our Stress Support is perfect!